People have a lot of opinions about tarot readings. Some think they’re creepy. Some think they’re a nonsensical waste of time. Some think the only purpose they could serve would be to entertain people. But none of these opinions come close to describing what tarot readings really are! Tarot readings are powerful. They’re reliable. They can provide unclouded, soothing and trustworthy navigation through everything life may throw your way. My own personal approach to tarot is practical and steadfast. In readings with me, we’ll look forward to see what your future holds, so you can face it with your eyes wide open. As an intuitive tarot reader, I don’t believe anything regarding the future is written indelibly in stone. What this means to you is that if the outcome I’m seeing doesn’t look good to you, we can explore all of the possible options to help you get on a better path to achieve your desired outcome. Simply put, predictions are empowering. Having an idea of what may happen gives us the ability to reconsider the path we’re on, and to make better choices as we move forward. I feel our lives are heavily influenced by the choices we make. If we become conscious of those choices, we can achieve clarity regarding the consequences of those choices. I gear my readings towards people who want control in their lives. Be sure to read through other peoples’ testimonials about how my readings have influenced their lives. Let me help you with what you’re facing in your life, too! If you choose a 30-minute psychic reading by phone, we’ll open with a beginning spread, in which I offer a general outlook regarding what I see for you in the coming year. It’s common for this beginning spread to answer some of the questions the client may have had. We’ll spend most of the remaining time focusing on any questions you may have left. During your reading, I want you to feel free to ask about anything you’d like. We’ll finish the 30-minute reading with a closing spread, to tie everything together. If you choose a 15-minute psychic phone reading, the entire focus will be on your questions. I’ll make sure we spend that time wisely to get to the answers you seek. When you call me for a reading, be sure that you’re in a quiet place that’s free of distractions. If I don’t answer your call right away at the time of our scheduled appointment, I may still be involved with another appointment. Wait another minute or two and call back. Be assured that you will receive the full amount of time you’ve scheduled. Prepare your questions in advance. But don’t ask the same question over and over again. This will prevent a useful reading from occurring. Please don’t expect me to have all of the answers to every question you have. I won’t. And nobody else will, either. Anybody who claims they will is not telling you the truth. Please don’t interrupt me while I’m doing your reading. An interruption can shut down the flow of information I’m receiving. In a reading, timing is the most difficult thing to foresee. 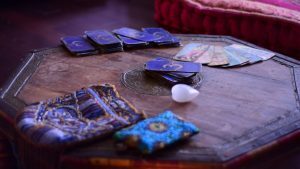 Tarot readings offer generalities regarding timing. If you need exact dates and times, I advise you to seek the input of an astrologer. Note that I don’t work well with aggressive personalities. If you aggressively try to influence me to get an answer you want, I may refuse to continue working with you. Please don’t expect me to stay on the phone with after our appointment time has ended. I respect your time very much. Please extend the same courtesy to me. Please let some time pass between your readings. This amount will vary from person to person, and from situation to situation. But allow some time to wait and to watch and for things to unfold. Also, too many readings in a short period of time may cloud my objectivity. If you want advice regarding your next reading, feel free to ask me what I’d recommend. Remember that tarot readings are like snapshots of where you currently are and where you’re going. You can change that course at any time. Also, remember that nothing is set in stone. If you don’t like something that comes up in a reading, please understand that you always have free will. You can alter your life’s path in any way that you wish to.